"The old adage of “take two pills and call me in the morning” apparently doesn’t apply to depression anymore. Increasingly, those who suffer from depression are taking the pills—but forgoing follow-up visits to mental health professionals. That treatment strategy leaves a lot to be desired and creates significant potential legal and productivity problems for human resource professionals—especially since incidents of depression are on the rise." ~ HR Magazine. Read the full review. "I wake up feeling like I'm going to die in the morning. It's just unbearable. It's agony." This is how A.B. Curtiss, author and psychotherapist, describes her battle with depression. Yet Curtiss has never taken antidepressants. Instead, she has written a book about her experience, "Depression is a Choice: Winning the Battle Without Drugs" (Hyperion, $24.95). Curtiss, a California family therapist, mother of five and grandmother of nine, said the genesis of her depression lies in her childhood. Her father was diagnosed with manic depression, as were she and her brother. Her father eventually died in a state of catatonic depression. Her brother has been taking medication for more than 20 years, Curtiss said, but it has not helped him. She went into the field of psychotherapy to help herself find a cure for what was running her life." ~ Chicago Tribune. Read the full review. "Happiness is our natural state. It is always available to us, in spite of what we feel at the time." "This is my favorite book so far (May) in 2002. Even though it is not Christian, it has many parallels to what the Bible teaches on the soul, happiness, responsibility, morality, volition, controlled and uncontrolled emotions, etc. She is particularly good at quips (sort of like proverbs) that help the struggling person take control of their life without drugs. Christians should replace Curtiss' concepts of "principle, doing something, and higher-mind thinking" with "Bible doctrine, practical application of the Truth, and putting on the mind of Christ." Here goes: "Happiness is our natural state. It is always available to us, in spite of what we feel at the time." ~ Biblical Exegesis. Read more. "In her thoughtful and at times explosive new book, A. B. Curtiss takes a look at these assumptions, exploring them from a philosophical, psychological, and often a deeply personal point of view." "In our culture, it is taken as an unquestionable fact that depression is a disease, that it is quite common, and that it is the explanation for everything from lethargy to conditions and actions that are much more serious. In her thoughtful and at times explosive new book, A. B. Curtiss takes a look at these assumptions, exploring them from a philosophical, psychological, and often a deeply personal point of view. She tells us that for many, depression is a choice. 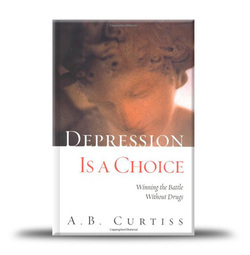 Using a technique the author labels "directed thinking," Curtiss creates a road map for converting the energy we put into being depressed into a strength that can ultimately lead us out of depression. " ~ Written Voices. "For quick help, though, in those moments when depression strikes, she recommends having some simple mind tricks on hand." "Curtiss gives specific examples of directed thinking which she has used to great effect in her life." "Over seventeen million Americans suffer from depression, with symptoms ranging from mild sadness to incapacitating misery. A.B. Curtiss is a board certified cognitive therapist, who was herself diagnosed with manic depression. Both her father and brother were also severe depressives, who did not benefit substantially from years of traditional treatment: psychotherapy and anti-depressant drugs. Through a trial and error process and much study, Dr. Curtiss came to realize that it was her reaction to the depressive feeling which was really incapacitating -- not necessarily the underlying chemical imbalance which was causing the problems she was experiencing. By separating the idea of herself from her "mind" she was able to distract herself from depressive thoughts as soon as they showed up. Curtiss gives specific examples of directed thinking which she has used to great effect in her life." ~ Readers Read. "It is possible for us to think our way out of the depths of despair." "Curtiss is a family therapist and cognitive behavioral therapist. She also has long personal experience of the condition now known by psychiatrists as bipolar affective disorder - formerly called manic-depression - in which periods of intense despair and misery are interspersed with episodes of highly charged energy and excitement. This book is a detailed, honest and at times alarming account of her ongoing struggle with depression, which makes good use of historical, philosophical, professional and some very personal perspectives. The book’s central message concerns the importance of what Curtiss calls ‘Directed Thinking’. She has found that it is not necessary to become a victim of depressed mood. She argues that although we cannot get rid of it directly, we do have some element of choice in the matter. It is possible for us to think our way out of the depths of despair." ~ Christopher Dowrick.